Most residents on the outskirts of Sandy are there for the peace, quiet and sparse population, but a community of squatters has made that goal difficult for neighbors of 43240 S.E. Music Camp Road. 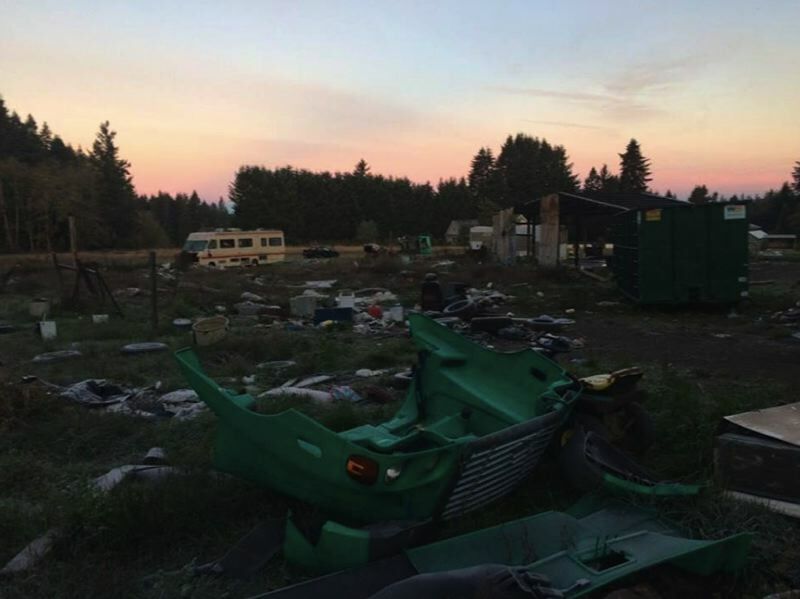 With the passing of its elderly owners a few years ago, and the imprisonment of the owners' heir, the five-acre parcel in rural Clackamas County has seen an increasing number of transients, whose presence and activities concern full-time residents. In response, Clackamas County contracted Nunpa, AntFarm Youth Services executive director, and his youth workforce earlier this year to clean up and transform the property. "The property is (currently) unoccupied," noted Tim Heider, Clackamas County public affairs manager. "The status is still bank-owned and the county has worked closely with that entity to clean-up the site, with cooperation from the local CPO and neighborhood. AntFarm was hired to do the cleanup and progress has been considerable and the cleanup remains ongoing." With the help of community volunteers, AntFarm has worked on the property for about six months. "It has taken a lot of energy for us, but it's been really cool for AntFarm," Nunpa said. So far the group has cleared 120 cubic yards of garbage, although there's plenty more left to dispose. Included in the debris were hundreds of tires and about a dozen abandoned and dismantled vehicles. The property had also developed a feral cat problem, and with squatters residing on the property, the Clackamas County Sheriff's Office received 62 calls regarding that address in the past two years. The residence was seized by the bank when the owners and heir allegedly neglected to pay fees put on the property. Now the parcel is under the supervision of an East Coast-based property management group. "For us it was really weird because it didn't seem like the property management had a clue what was going on here," Nunpa noted. Since contracting with the county, AntFarm has used the cleanup of the property as part community service project and part opportunity for the youths in AntFarm's program to gain paid employment. As someone who has worked with people with addiction for years, Nunpa also said signs of drug use on the property has sparked conversations about addiction and rehabilitation. "Really it has been a community effort," Nunpa said. Several community members took time to help the nonprofit group clean the property on the weekend of Nov. 24. Many in the community hope the property will end up under AntFarm's ownership as well. "There's been this floating idea that maybe the mortgage company will donate the land to AntFarm," Nunpa said. "We'd love a property where we could have kids out there, but that's not our intention in this. It's really about the community and helping the community out." Though he's not certain AntFarm will ever own the property the group has spent so much time recovering, Nunpa hopes this project will lead to more contracts with the county. "We have no way of knowing the future of the property," Heider noted, "but the county has worked diligently over a long-period of time to resolve issues at the site,"